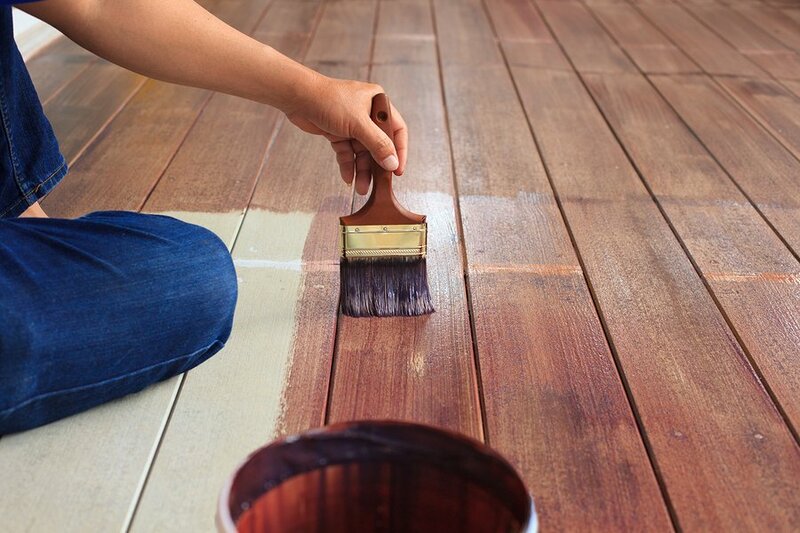 When painting outdoor decks and porches, it is important that you use only the best paint for wood. A quality paint is going to make the house stand out from all the others on the block. You don’t have to be an experienced painter to achieve a professional finish. You simply need the right materials and tools to get the job done. Do you know how to find the products you need? Let us show you how to find the best outdoor paint for wood. Then, you can be the envy of all the neighbors on your street. What Types of Paints are Good for Wood? There are two main types of paints that can be used on your exterior surfaces. An oil-based paint is going to dry at a slower rate than latex. Usually, you can expect at least 24 hours to fully cure. If it needs to be cleaned, turpentine or a paint thinner generally works well. An oil-based paint is the best choice if you are painting over a surface that has previously been painted with an oil-based paint. If you use a latex paint, it will end up peeling. Latex paints are known for their quick dry times. In addition, they clean up much easier than an oil-based paint, normally with just soap and water. Latex will expand in warmer temperatures and contracts during cool temperatures. This makes it durable to use in most any condition. There are also several finishes that can be used when painting exterior projects. The sheen of a paint describes the degree of reflection the paint has. The less sheen a paint offers, the less stain-resistant as well. Here is a listing of the various sheens that are available. This is the toughest option and cleans up easily. It has maximum resistance to scuffing making it ideal for high traffic areas. When used on shutters or trim work, gloss paints provide a nice contrast to the house’s siding. The downside to a gloss paint is that it will show surface imperfections more than other sheen types. This option is durable and super easy to clean up. It offers many of the same benefits of a gloss paint but with less shine. Unfortunately, these are mainly geared toward interior work like trim work and casings. This can often be referred to as a low luster or eggshell. It offers a combination of moderate sheen with easy-clean capabilities. This option will work well on siding if it is in good condition. This is mostly used for the vinyl and aluminum siding that is dented or scratched. That’s because it will hide imperfections and splatters very little. It is also easy to touch up at a later time. While you can choose for yourself what to use on your exterior surfaces, there are some options that are better than others. For a quick reference guide of your best options – check out this little reminder. If the paint you choose is the best paint for wood, it will have these characteristics. This is the ability to conceal the surface where the paint is applied. Hiding power comes from a mixture of the paint’s pigment and how it is affected by the application. The paint’s ability to keep its original color after exposure to the elements is what makes it a quality product. This will only refer to your tinted paints of course. Some paints will form a white, chalky powder on the surface. When this occurs, the paint will become lighter. This process will occur over time when the binder has time to degrade. A quality paint is going to keep the excess moisture from coming through the substrate into the paint layer. This is especially important when looking for the best porch paint. When you want the best exterior paint for wood, you must select a top brand. Here are three that are worth your money. This brand has been a leader in manufacturing protective coatings and paints both for home and industrial purposes. It was found in 1921 by a sea captain looking to end corrosion on his metal deck. Not long after that, he incorporated whale oil into the formula he was using. While the company no longer uses whale oil as a product, they are still one of the most trusted brands on the market. Now you will find a full selection of polyurethanes, epoxies, latex, and alkyds. With more than 30 years of experience, the KILZ brand offers a full line of primers and paints. They supply superior coverage as well as a high resistance to stains and odors. The fast drying formulas are good for both interior and exterior projects. There is a KILZ product for every job. Valspar is currently the sixth largest coating and paint corporation in the world. They were found in 1806 out of Boston, Massachusetts. Just as recently as June of 2017, they were acquired by Sherwin-Williams, another strong leader in the painting industry. Valspar prides itself on having a color for every job. Whatever project you are working on, there is a Valspar paint that will open your eyes to the beauty of color. Here are the top five choices for the best exterior paint for wood, outdoor decks, and porches. The Rust-Oleum Painters Touch is a great option for the best paint for decks. There are some many other uses for this product as well. You can use it on a variety of outdoor and indoor projects. It is versatile and can be applied to wood, plaster, metal, masonry or unglazed ceramics. It features a low-odor formula that will resist chipping. In addition, it provides long-lasting protection of your exterior wood. For quick project completion, you’ll enjoy that it dries to the touch in as little as 30 minutes. The flat finish will minimize surface imperfections. The paint comes in a variety of sizes and an astounding number of colors to make every project a personalized one. This paint is so versatile it can be used on many project surfaces. This includes your interior and exterior work involving wood, plaster, masonry, unglazed ceramic and metal. The water-based acrylic formula offers low odors and will resist chipping. It also provides a long-lasting protection. The Painters Touch will dry to the touch in just 30 minutes so you can get the projects done faster. The satin finish helps to minimize surface imperfections while applying smoothly and flawlessly. If you need to clean it up, just use some soap and water. It doesn’t get much easier than that! There is a wide array of colors and shades to choose from, perfect for any assignment you are attempting to complete. The KILZ Exterior Paint is a great choice for the best wood deck paint. That’s because it offers superior coverage and a vast protection against the elements. This all-purpose exterior paint will resist peeling, cracking and blistering. It has a unique water/oil based formula which allows for amazing adhesion, longevity, and versatility. This can be used on so much more than wood surfaces. Consider applying it to sanded glossy surfaces, stucco, and masonry as well. Once you are done painting the deck and porch, you can take this product right to the siding of the house and barn as well! The paint will dry to the touch in just 2 to 3 hours, but allow 6 to 8 hours before recoating. Another option from the KILZ brand comes this porch and patio latex floor paint. It is highly durable and easy to clean. In addition, it will resist scuffing, cracking, peeling and fading over time. It also offers a mildew-resistant finish. The low-luster enamel surface is going to endure on porch and deck floors through all weather conditions. That’s what also makes this best deck paint a great option for your patio siding as well. When you are done with those projects, move on to the trellis, trim and siding. This paint will dry to the touch in just 1 hour and you can recoat after 4 to 6 hours. After reading through the best deck paint reviews, I can confidently recommend this option as well. It is capable of superior finishes on not just wood, but also primed metal, steps, porches, concrete and railings. Use this paint for your exterior or interior projects for a beautiful finish. The multi-purpose and weather-resistant formula will clean up easily with just water. It dries to the touch in just one hour and can be walked on within 24 hours. Choose from a variety of shades to complement any project you are working on. There are some steps that will be involved in painting decks and porches. Here are some step-by-step guides on what you’ll want to know. Fix any nail or screw heads that have popped out. Fill in any cracks that are larger than 1/4-inch wide. Use epoxy putty. 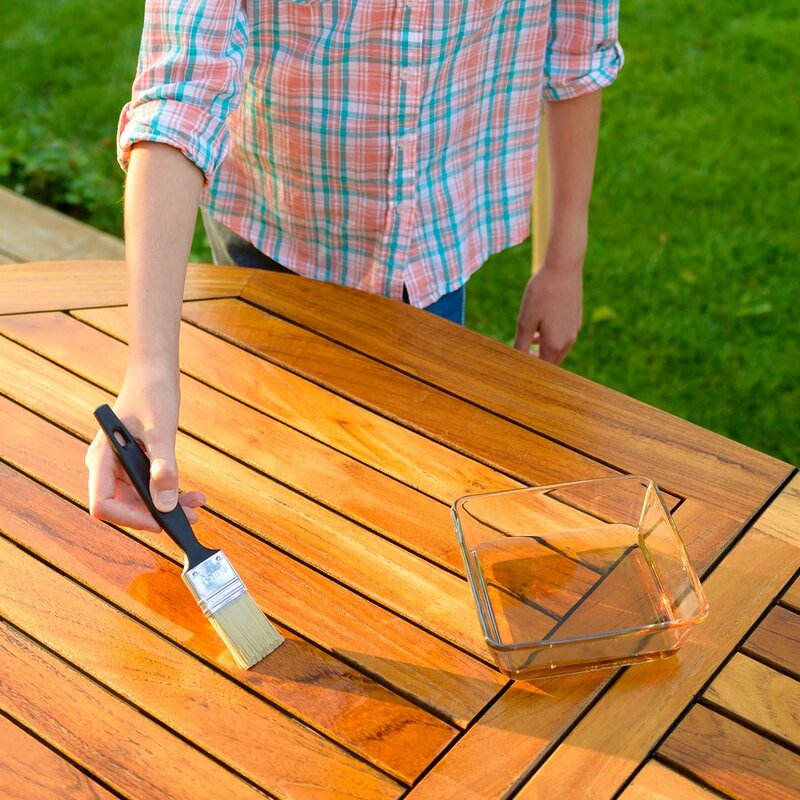 Stain the surface to match surrounding deck boards. Use a stain remover on any wood that’s been previously finished. Apply deck wash to all wood surfaces. Allow this to dry for at least 48 hours. Sand ridges with 80-grit sandpaper. Be sure all the dust gets cleaned up. Protect surfaces such as siding with painter’s tape and a plastic sheeting. Don’t forget to cover nearby plants. Paint your surface according to the directions on the paint you’ve chosen. Sweep away loose debris with a broom. Use a garden hose or pressure washer to deep clean between cracks. Let the surface dry for at least 24 hours after cleaning. Scrap off any existing paint with a scraper or power sander. Then, clean the surface to remove debris. Cover any areas you don’t want paint. Apply exterior primer and allow at least eight hours. Paint sprayers can achieve a quality finish in a fraction of the time. Now that you are equipped with the tools to find the best paint for wood, it is time to get those projects done. Take your time and make a wise decision on which paint is best for your home. Once you’ve completed the painting jobs around your house, you can stand back in awe and the beauty that has been created.